Growing information literate human beings is really hard. I’m just going to put that out there. Over the last few years the information landscape has changed so rapidly, that for the last 4 or 5 years, despite my sincere commitment and diligent efforts, I haven’t confidently known how to help students and teachers successfully navigate the yellow brick road to information literacyland. Our library program has the truly good fortune to be given a high school faculty meeting each year for which we get to develop and present “library programming” for our high school faculty. While I am grateful for the vote of confidence and commitment that this shows from our Administration, I can also honestly say that these sessions have proven to be the most sweat and terror inducing 50 minutes of each of the 4 school years since I arrived here at Mid-Pacific. In my first year here at Mid-Pacific, we determined that there would be great benefit if all of our faculty understood research as a process so we set about planning a to embed that concept in our faculty members’ minds and practice. 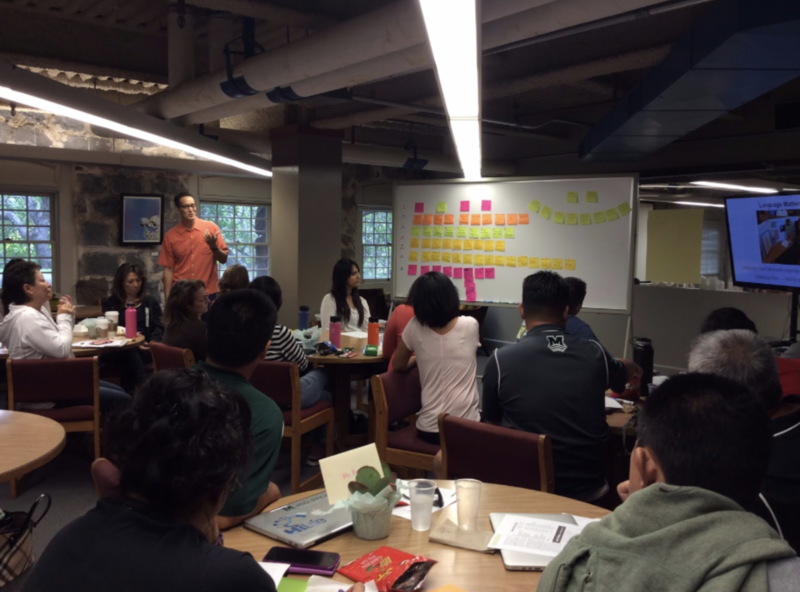 Mid-Pacific embraces active, constructivist, student-centered learning. If active learning is how students learn best, why should faculty learning look any differently? With this philosophy in mind, faculty meetings here rarely involve presenters standing in front of the auditorium telling us about a concept or a new program for long periods of time so in our faculty library presentation we set out to engage our faculty with an activity intended to develop individual and group understandings of research as a process. Embracing Constructivist Learning–Put Teachers to Work! We had teachers sit in small groups. 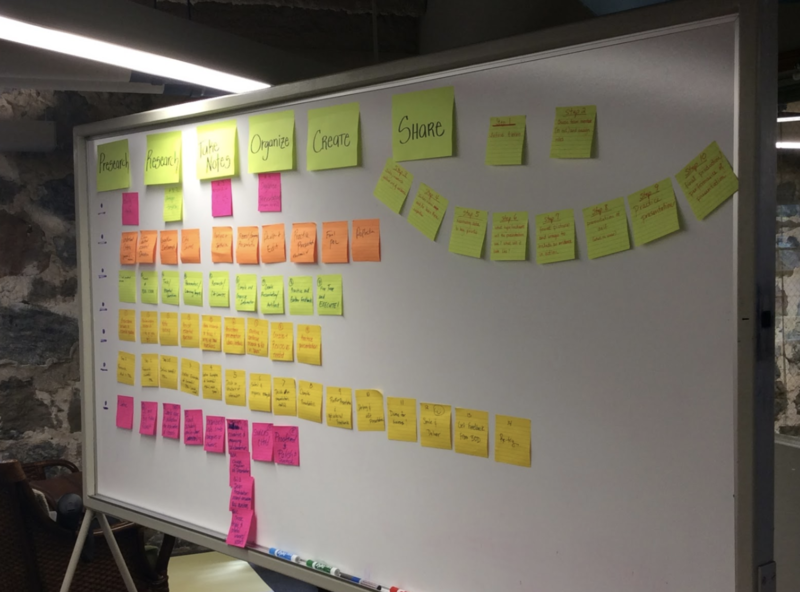 Each group was given 6 large Post-it notes and asked to document the steps they would follow to accomplish a research or information gathering task. I think we had 2-3 similar prompts that groups could choose and we also gave groups the option to choose in information task of their own creation. We then had each group put their steps up on a board and we clustered like-steps from various groups together. Unsurprisingly, the steps developed from most groups aligned fairly easily with steps of the Big6 and we as a faculty began the process of “co-constructing” our understanding of research as process. 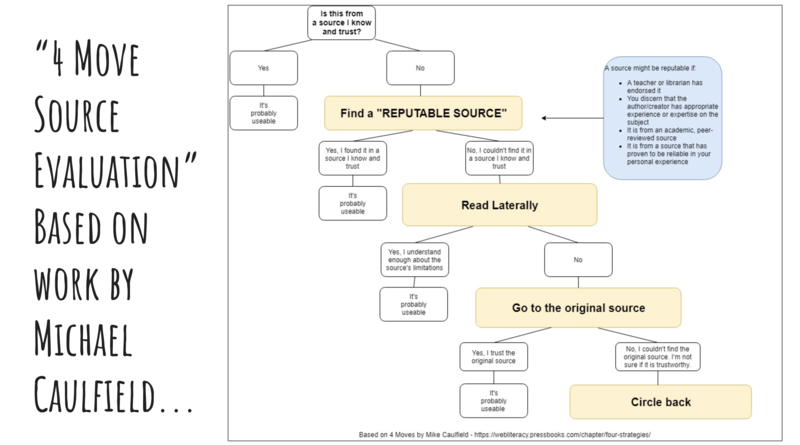 We’ve since re-revised our research process language. The following year, we addressed the idea that students were probably not engaging as deeply with sources as we all hoped to see. Out of that faculty meeting, grew the practice of asking students to submit annotated works cited lists rather just a list of works cited which was our norm. The very skeletal annotation format that came out of that meeting eventually gave way to adoption of the OPVL citation format encouraged by the International Baccalaureate Program, and as of this year OPVL annotated works cited lists are being required in grades 9-12. Our annotation format. Origin: Where is this source from? Purpose: What is the author/creator’s purpose for publishing the content? Value: What is the value of this source to me as a learner for this particular research project? Limitation: In what ways might this source be limited? (Perhaps in its perspective, scope, or age…). 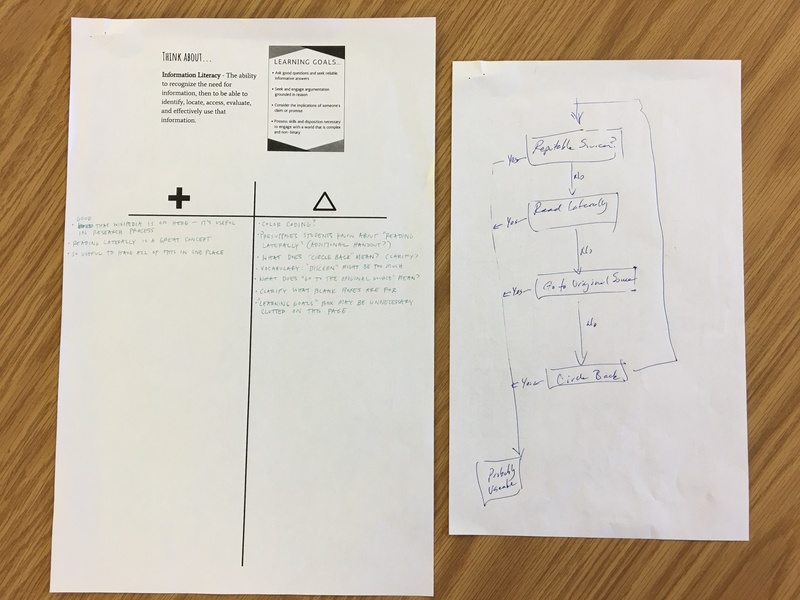 Last year, we had our faculty work through a source evaluation process by having them take articles on the vaccination debate and place them on a coordinate grid as they saw fit. Our hope was that the technique for visibly showing our understanding of a source’s “perspective” (we’re trying to avoid using the term bias because it is proving to be too loaded a term for our students) might “become a thing,” but alas, while we got good feedback, I think the process involved too much time and preparation for the idea to scale beyond a handful of our most committed “information literacy” oriented teachers. 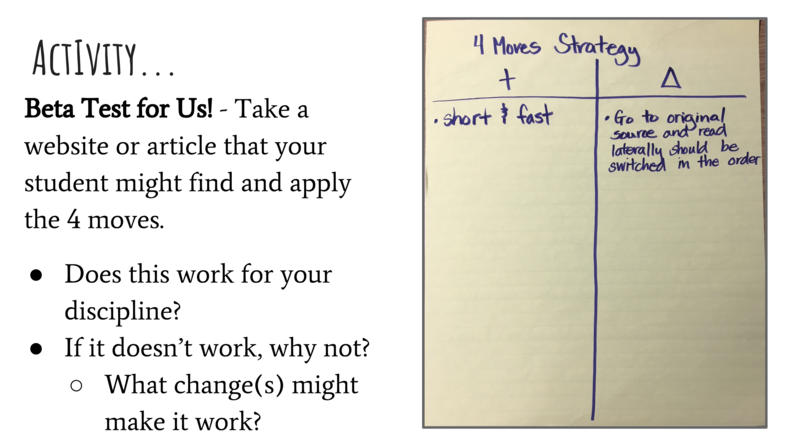 We have been struggling to come up with a scalable instructional model for source evaluation that our content-area faculty might be able to use with students in the course of their everyday work. 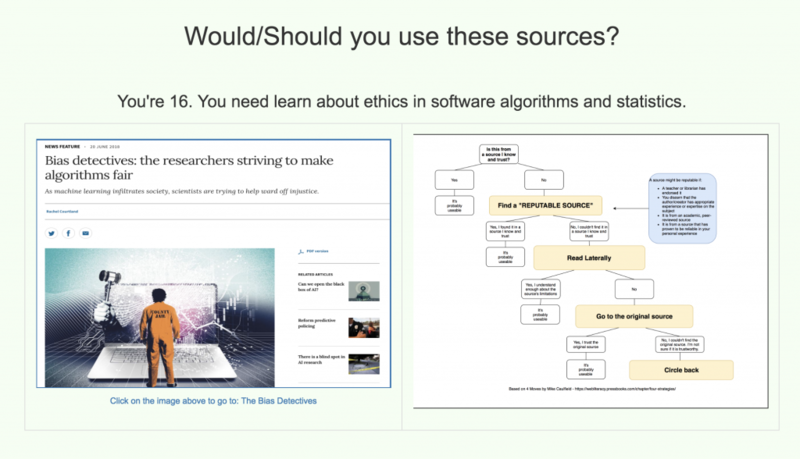 Over the summer, we stumbled upon Web Literacy for Student Fact-Checkers by Michael Caulfield in which he presents a “4-move” process for fact checking web sources. We were intrigued because it gave us a potential model for source evaluation that seemed effective, yet “light, quick, nimble, and fast” enough that we believed that it might be applicable at scale beyond a dedicated “library lesson.” We worked with his process and decided that our particular population of students would likely find more success with Caulfield’s 4-Moves if we changed the order of two of the steps, so we built a prototype flow chart and decided that we’d have our high school faculty beta test the process to see if it might meet their needs. We quickly talked about the “why” and why this process mattered. We presented the model itself along with a quick 9-min explanation of the process with examples. We gave the faculty their task and set them to work. 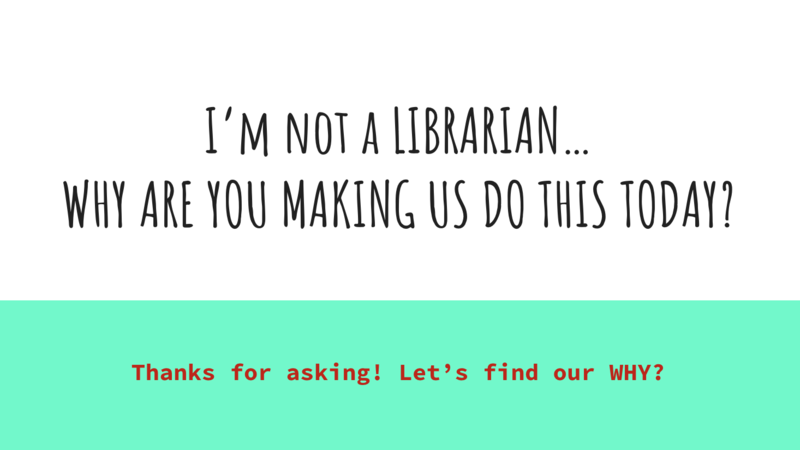 After my partner librarian, Nicole, gave a brief overview of the process, we tried one together as a whole group. Looking at this article from Nature. Because we were “16 year olds” we’d never heard of the source so we decided we needed to read laterally and searched [Wikipedia Nature] where we found out that it is one of the world’s most widely cited scientific journals. It may not make complete sense, but our full faculty meeting slideshow is linked here should you be interested. Informal feedback from our faculty on our session and activity has been quite positive. A few let us know that the activity itself was helpful to them for their personal knowledge and awareness as USERS of information, and we got some good formal feedback about the process as well! A sampling of feedback from our groups of high school teachers. As soon as we have a moment, our plan is to take all of the feedback from the faculty working groups and weigh which changes we think we might incorporate into our 4-Move process itself and/or changes that we might decide to make to the document (which we envision as an 11X17 poster in each classroom). 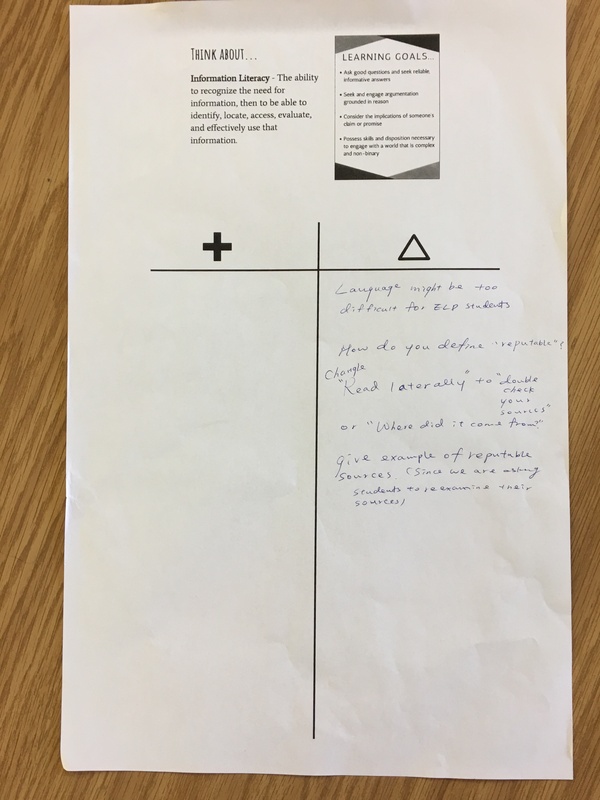 Our initial thoughts are that some of the feedback such as changing “read laterally” to some other more student-friendly term will get a lot of consideration while other feedback is primarily useful for us to consider instructionally (defining terms clearly, etc.) as we eventually roll this process out to students. Once we have gotten our ducks in a row on the library side, I will likely seek 5-10 minutes at a future faculty meeting in order to update our faculty on how their feedback has either been incorporated into changes to the process or document(s), or how their feedback will inform our instruction as we roll the process out to students. Some statements from faculty such as, “If you use databases, sources are already vetted” indicate that we still have some conceptual information literacy professional development to do, so we plan to work with individual department chairs to find time when we might get some department meeting time to deliver more discipline-specific professional development for our teachers in some key departments. This Seems Really Hard and Fuzzy So What’s the Payoff? In the bigger picture we are coming to realize that we have to get students to think about source evaluation in two main phases. Phase 1 – When you are initially selecting sources from a results list, you should be able to very quickly apply the 4-Moves to help you choose what appear to be your most promising sources. In a broad sense both kinds of source evaluation thinking need to become part of the “always on” mental models that students employ as they do anything from find the best video gaming hacks to the policy positions they will choose to support as soon-to-be voters. For us here at Mid-Pacific in the shorter term, we have started requiring students from 9-12th to turn in OPVL formatted annotated works cited lists. The annotation requirement is not an end in itself as much as it is a scaffold that we are employing to “encourage” students to practice the thinking that goes into both phases of source evaluation. To my mind, the information gleaned while executing the 4-moves help to inform students about a source’s origin and, perhaps, purpose; deep/close reading that is done when they engage in activities like placing their sources on a continuum or in a coordinate grid should inform both the source’s purpose and limitation; and I would hope that students would be evaluating a source’s value to them as learners throughout the research process. Growing information literate humans is hard. We’re struggling to figure out the best paths forward, but we hope that little-by-little and step-by-step, we’re slowly but surely identifying skills and mental models that need to be in place for our students to successfully engage with a universe of information that has grown to be incredibly complex and challenging. We need all the help that we can get and we’d be so grateful to hear about strategies you are trying with your students. Please hit comment below and share some of them! This is all so helpful. Thank you for sharing, Dave. 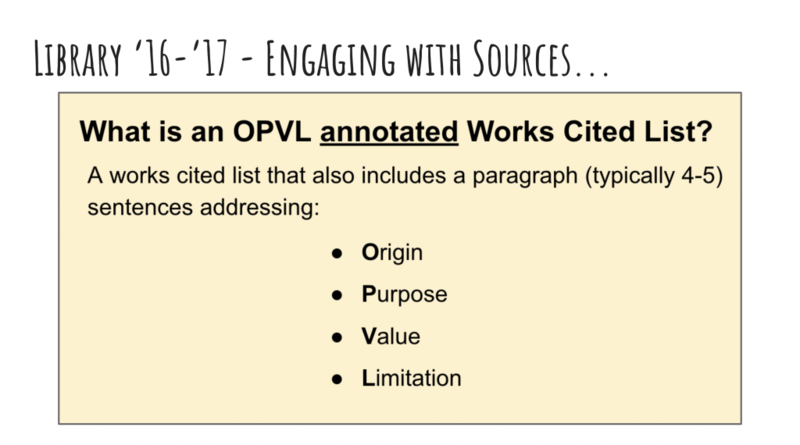 I love the OPVL framework for annotated bibliographies and will definitely be sharing it with my teachers. I’m curious to know if you have introduced the 4 moves to your middle school students. 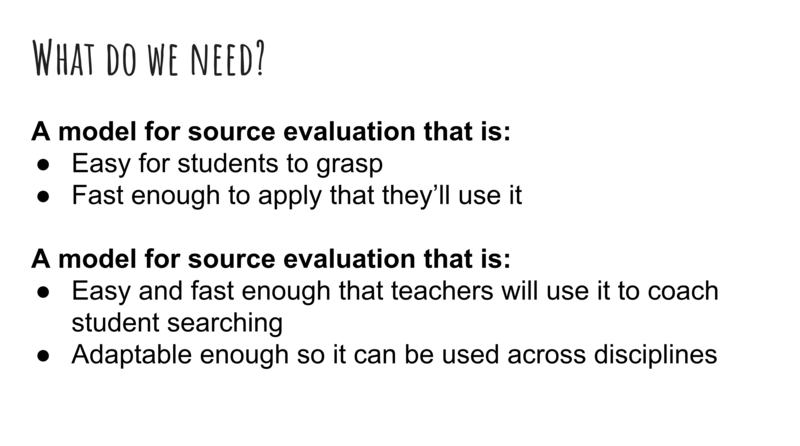 I’ve been using a modified version of RADCAB with middle school students to teach source evaluation, trying to make it more “light and nimble” and encouraging students to read laterally when looking at a source’s authority or perspective. I know that Michael Caulfield is not a fan of checklists like RADCAB and CRAAP. I think his 4 moves are great but I wonder if it is too much (or maybe not enough?) for middle school. Thanks again. You gave me a lot to think about. I know that this might ruffle some people’s feathers, but honestly, our focus in middle school tends to be on the more “mechanical” processes and skills than on a lot of source evaluation. We will talk on occasion about the CRAAP test with our middle schoolers. More often, with MS kids we “think aloud” as we are looking for the elements of citation so they know WHY we’re asking them to locate the information. Why is knowing about this AUTHOR’s college degree or job important? What can we learn about whether this article is pro/con from the words in this title? What do you think about using this article on teen social media use from 2002? etc. With my middle school kids, I feel like “recognition” of the elements is satisfactory. Developmentally, I think it’s really exceptional for a middle schooler to be able to do good source evaluation so my goal is to have them be really good at the repetitive mechanical parts like where to find the copy/paste citation in a database so that we don’t have to spend hardly any time on those things with our high schoolers. Every minute we don’t have to spend teaching mechanics in HS is a minute that we can invest on source evaluation when they’re more developmentally able to take on the task with some success.